It is now common knowledge that the FBI and its long-time director, J. Edgar Hoover, were responsible for the creation of a massive internal security apparatus that undermined the very principles of freedom and democracy they were sworn to protect. While no one was above suspicion, Hoover appears to have held a special disdain for sociologists and placed many of sociology's most prominent American figures under surveillance. Using documents obtained through the Freedom of Information Act, this volume portrays the FBI's stalking of the sociological imagination, offering a detailed account of its investigations within the context of an overview of the history of American sociology. This groundbreaking analysis of a previously hidden chapter of American intellectual history suggests that the activities of Hoover and the FBI marginalized critical sociologists such as W.E.B. Du Bois and C. Wright Mills, suppressed the development of a Marxist tradition in American sociology, and likely pushed the mainstream of the discipline away from a critique of American society and towards a more quantitative and scientific direction. 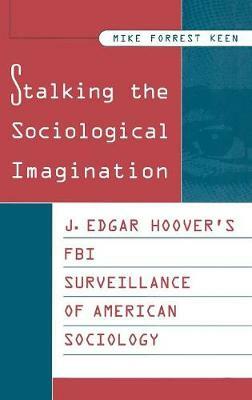 The author also turns sociology back upon the FBI, using the writings and ideas of the very sociologists Hoover had under surveillance to examine and explain the excesses of the Bureau and its boss.